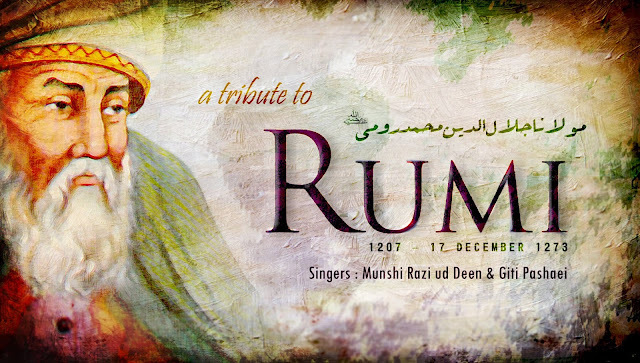 Rumi: Was a superstar while he was alive and he has been admired. Loved and cherished in the East ever since and in the West and globally since the 1990s. 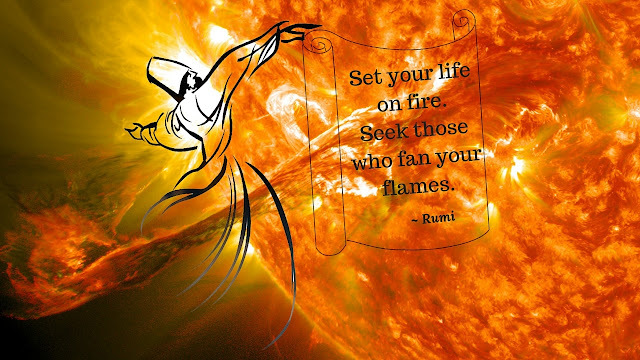 Rumi -The great Poet of mystic Love, of the 13th century has composed his poems and prose works in Persian. 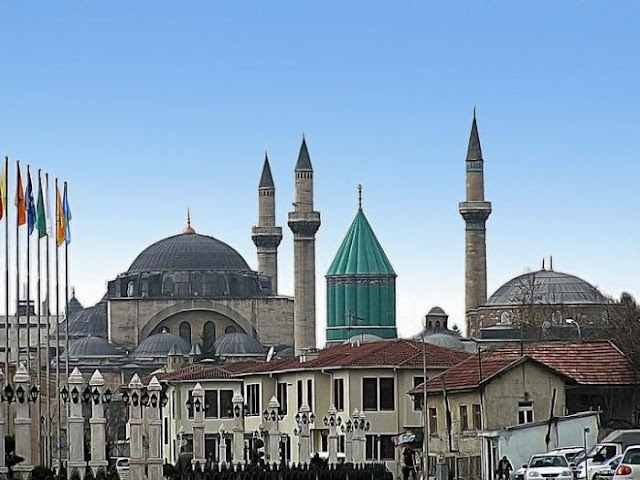 Rumi was the most famous personality in the region and his fame and unique mystic poetic style full of Romance had already spread 3,000 miles away to India during his lifetime. It's impossible today to imagine how popular poetry of Love with a mix of mystic was at the time of Rumi. It was the pop music of its time. 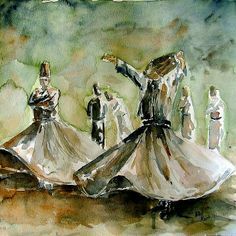 Rumi is sometimes called the Master of Mystic Love because the Sufi path strives for ecstatic ego and annihilation in the fires of Divine Love. His Sufi poems and works have the real essence of union with Beloved God, " the primal - The God", the concept of tauhid (Indivisible Oneness of God). 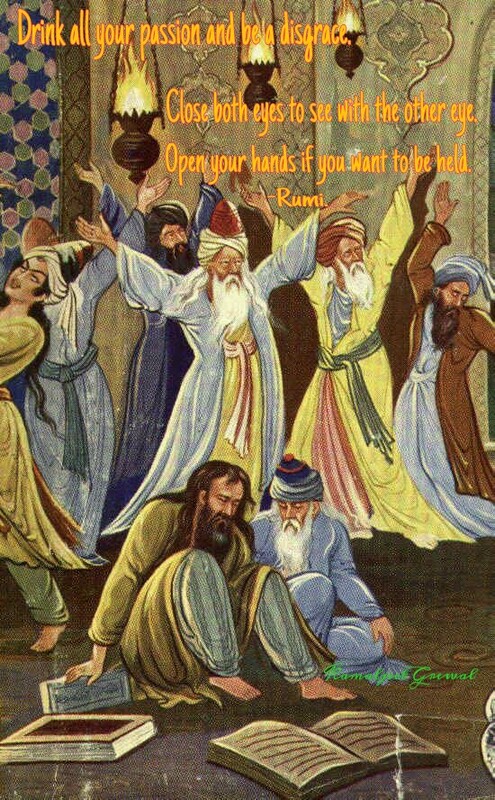 Rumi's unique style of poetry became all the rage at the time. He blended romantic imagery of classical Persian poetry that features a beautiful female companion, a cup of wine, a flower garden, moon lit night and candles burning with quotes. 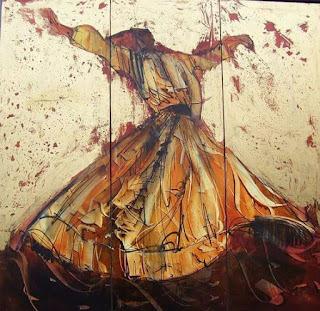 In his poems he added mystical references, direct emotional expressions, issues involving maturity and growth of the soul and even anecdotes about daily life.There are four major themes that run in his Sufi words: Heartache, Drunkenness, Disagreeable Lover and Aloneness. Feel the romance that Rumi has captured here so beautifully. Translation is an art but to explain the poem in simple words, expressing what the poet wants to convey is a science.It is difficult to follow in depth the message and spirit of Rumi's poems, based only on translations. Kamaljeet Grewal---Guest Blogger of "Romancing Mystic Love of Rumi"
I make music at night . Seekers and Lovers are creative by nature! And are deeply felt and embraced by the loving heart. The night becomes a catalyst! That soothes...Calms and balms...The burning fires of separation from the Beloved beloved! Music is the wine of love...The whispers of the soul are drowned in the cacophony of confusion and din of the day. 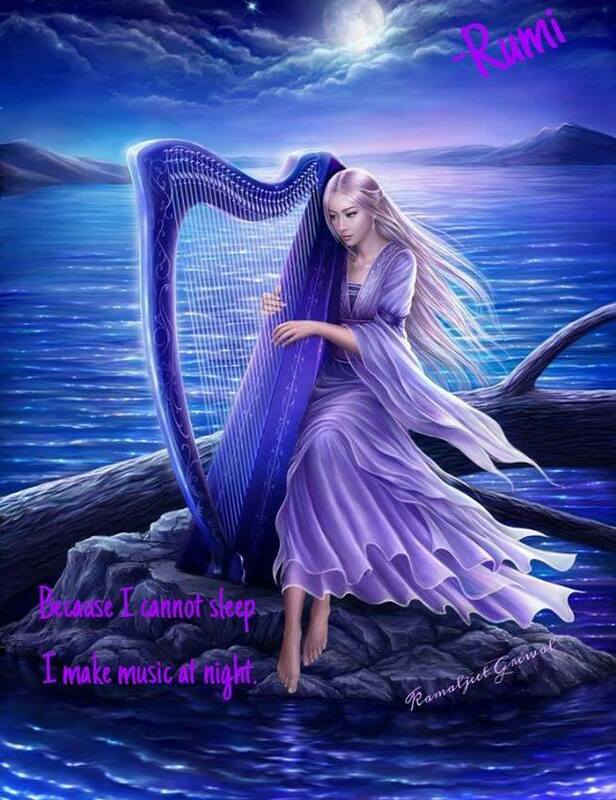 But night provides the silence for the soul to display its abilities and divine music is born! Soul is the origin of soulful music! The bonds are felt stronger in the silence of night..when the mind is shut off from cares and responsibilities of the day ...and in this calm state music flows spontaneously from the depths of the soul ! Drink all your passion and be a disgrace. You have to move and make sincere efforts to reach the Beloved. He has blessed you with this beautiful life, movement, will and a mind...Along with a feeling heart and eternal soul. It is only in this state when you offer yourself holistically at His altar...Does that ultimate merge with the beloved, take place. the sea of fear ! Love is bold and Beautiful! 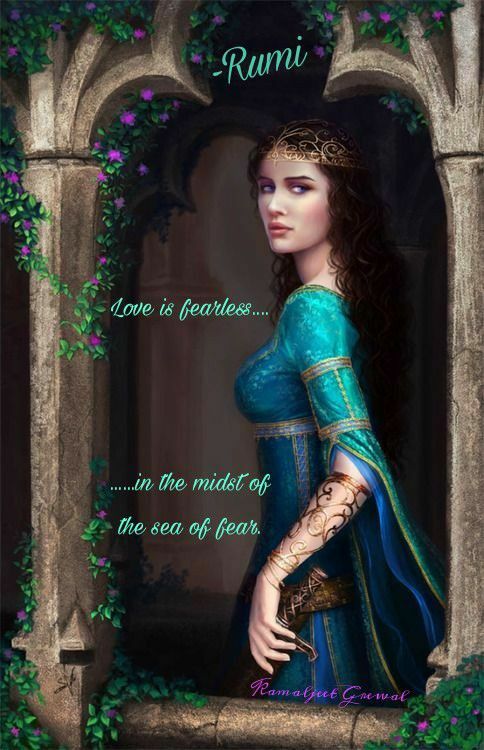 Love in its natural form is docile..calm ..and soft ...but if it is challenged ...it can become the bravest..Fearless warrior! It will never accept defeat! Love is pure and genuine ...and that which is untainted by selfish a motive...is a WINNER...all the way! Love is like a gushing stream down the mountainside...unstoppsble ..cuts through the steep cliffs ...unharnessed ! Do not ever try to come in the way of Love! Allow Love to flow in its melodious fluidity! And see it spreading fragrance...all the way! Requires balance . . . is not a matter of intensity but a balance and order and rhythm and harmony. Fortunate , indeed , is the man who takes exactly the right measure of himself and holds a just balance between what he can acquire and what he can love . . . don't loose your balance in the processing of loving , it's better to rise from love as from a banquet -- neither thirsty nor drunken. Rumi is only sending us a Reminder.. We know that Fear is the weapon of Ego.. a disaster in life. Cheers to Love, Faith and Hope. Let´s focus in the colourful essence of LOVE! Love is usually tender, gentle and calm but when it is challenged or provoked it is like a storm in an ocean- it cannot be controlled, calmed or defeated. It breaks all boundaries and overcomes all hurdles. The power of love should never be underestimated. The heart and its positive functions provide joy and happiness to the total being ...his mind...Soul ...and the moments that he goes through! Rumi , the great seeker ...always gave importance to pursue actions and paths the destination of which is ultimate joy ! Little joys of life like pleasant surprises ...worldly relations blossoming ...new beings entering our lives ...successes ...travels ...all these are sources of joys. Yet the lessons that they leave behind for us, are wise ..sagacious and astute ..that no book or school can ever teach ! “The wound is the place, where the light enters ' another quote of Rumi stresses the same! Diamond is the result when a stone is brought under high pressure and temperature...so the flower which is result when a seed is sowed in dust ...as the pearl that is the result when a drip of water is stored in darkness ...similarly a thought that undergoes intense pondering. When a star shines, it consumes its very being ....no marvellous is the result of comfort....yes when a thought is matured and is decorated with experience of odds and even...It becomes wisdom , when a wound is deep and is cared lovingly then it blooms ....reflects light . True that.... the universe works for us not against us!!! If a rough patch/troubles cross our path and after intial panic if we pause and analyze m so damn sure that we DO find a reason which makes us understand for our own betterment... cuz God cannot talk to us therefore, he opts for diff ways to communicate wd us by giving happiness or sorrows!!!! The wounds maybe healed but the scars remained, that remind us always of the pain we went thru, getting over it is real hard but the fruit of it is sweet and triumphant. Time heals every wound in our lives but don't dwell on the past your story can't be erased but your future is yet to be written make the most of what's going to happen instead of worrying what you can't change enjoy the moments in which you could be happy. What the world needs, is Love.What the world no longer needs, is the lack of Love. create our universe from inside out. Love starts always in the heart. Why do we create and the more, why do we accept the absence of peace? Why do we tolerate and even more, put people with obviously no inner peace and Love inside on the top of our nations of the world, or as leaders of our companies that rule the world in their own way of gaining profit above all? Why don´t we support the ones that dare to resist and go for the Good? Why don´t we take a risk and reveal our own power of creating consciously? Inner Truth of highest purity. Who dares to take all his veils from the wounded heart inside and goes through the responsibility of being the source of all the lack of Love inside oneself as Alpha – Sender to Omega? What comes around goes around. Still one is untrue to oneself. Still one resonates to this unwanted - so choose to let go and resonate higher in Love, peace, joy, compassion, kindness, forgive. .
Strive for your true heart purpose and take nothing for granted. What is given, may be taken. What was lost shall easily be given back! All wounds bleed, but eventually heal. They are painful but in the process of healing, they teach us about life. We tend to mature and getter wiser after a difficult period of pain or grief. Life wound reshape us...This wounds with time become points of strength in our life...No need to be shame of them because they show that we are a live...life warriors are the only ones who have wounds so be proud of yourself and don't worry. 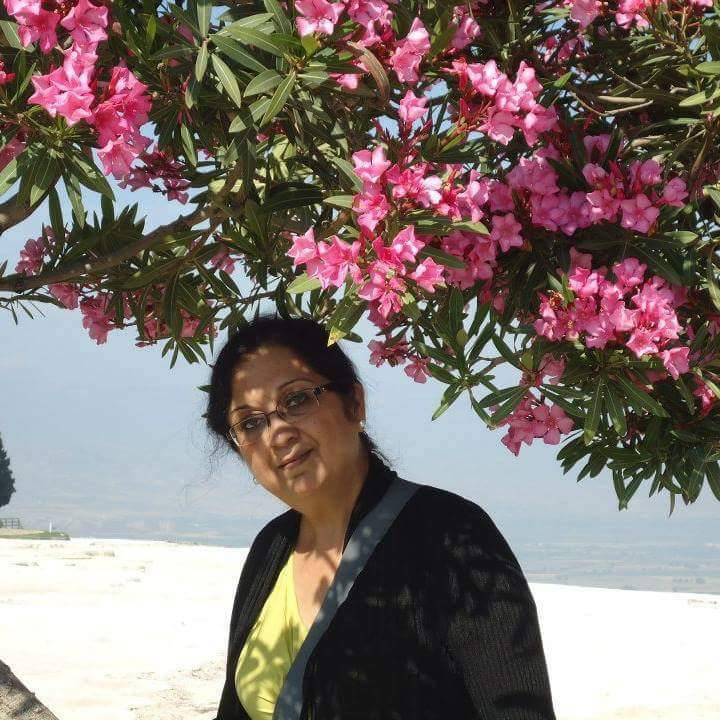 I am Thankful to Ms KamalJeet Grewal for sharing this right up ” Romancing Mystic Love of Rumi” as a guest Blogger.She is Masters in English Literature, having a degree in Management in Travel & Tourism, Montessori trained, she follows her passion in education by running a Montessori School and a Teachers' Training Institute. I can only comment as a reader and say that I have immensely enjoyed the interpretation as Romancing Mystic Love of Rumi’s poems by Kamaljeet Grewal.